State Rep. Brian Dempsey of Haverhill is vacating his seat. There are three candidates seeking the Democratic Party nomination in the October 10th special election. They are: Paul Magliocchetti and Andy Vargas. * Eva Montibello did not qualify for the ballot just days after this editorial was published. “In an interview with Paul Magliocchetti in the Valley Patriot, which did not attempt to contact Councilor Vargas for comment, Councilor Andy Vargas’ position on immigration was blatantly mischaracterized. What is utterly false and disappointing is that Vargas is lying. 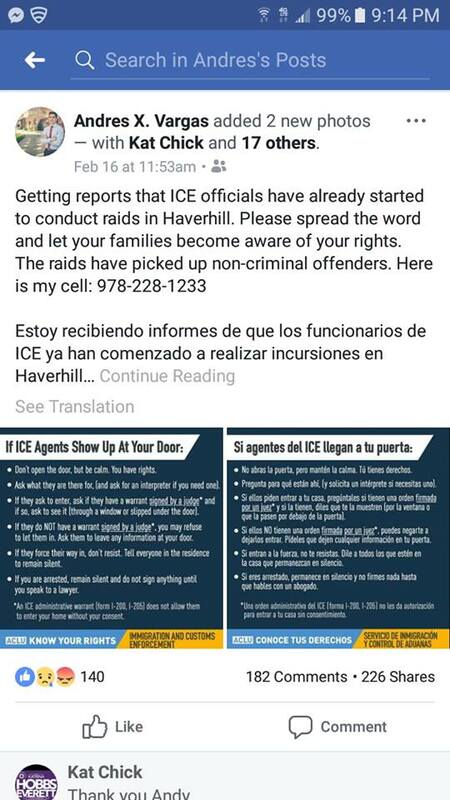 He did INDEED post a warning on Facebook of an ICE raid IN PROGRESS in Haverhill, and while he flowered it with pretty political language about civil rights – the fact is – drug dealers, gun runners, wife beaters, and rapists all had access to his public warning and it could have cost the life of a cop, maybe more. His ideological intentions are irrelevant. Both Magliocchetti and Eva Montibello have both called Vargas’ actions reckless. No amount of political double-speak can mask that. He stated in his press release that he believes in deporting illegal aliens who commit felonies, (hear that lefties?) yet, he considers himself an advocate for “immigrants” and tells his followers he supports sanctuary cities – a measure which specifically prevents such deportations. So, the Eagle Tribune pressed Vargas for his official stand on sanctuary cities, but wouldn’t you know it? He refused to answer the question. What’s more, while Vargas complained that The Valley Patriot didn’t call him for a quote (in someone else’s interview), when it came time to interview him this month – he suddenly had nothing to say. It’s not hard to understand the twisted political language and intentional efforts to deceive by state representative candidate Andy Vargas when it comes to immigration and police. He really does think the voters of Haverhill are stupid. Looks like we’ll find out on October 10th. I had not heard of this. If this story is indeed true, it’s shocking. It is 100% true – and Andy Vargas is lying – period.